The Hawke Sapphire® ED Binoculars feature a high performance optical system with dielectric prism coatings – giving the user the brightest image reproduction possible. The ED glass eliminates Chromatic Aberration. This incredible optical performance is housed in a magnesium alloy open hinge design - 8x43 and 10x43. Available in black or green. The highly tactile, performance rubber armour has been designed to allow for comfort, yet provide adequate grip. The Sapphire® ED is supplied with a comfort neck strap and a genuine leather hard case. Sapphire® ED, a step ahead in binocular design. 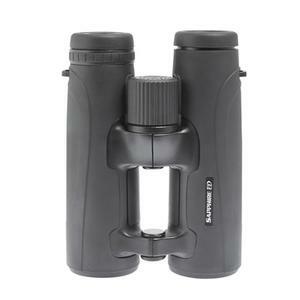 Pleased to say my order for Hawke Sapphire 8x43 binoculars arrived quickly and in perfect condition. In my opinion these bins are a bargain, very clear, bright image,from a known brand with a good warranty. Good build quality, I doubt these could be bettered at the price.